Bathrooms are the one place that we tend to neglect when we are decorating. It can be difficult to create the feel or look that we really want when many of us inherit a bathroom suite and often the tiles too. It can be costly and time consuming to completely renovate a bathroom so many of us try and put our own stamp on it with smaller changes. There are lots of ways to really create a bathroom you love even if you aren’t going to replace the bath so here are some ideas to help you create a truly modern bathroom. Did you know there are quite a few products out there that can help you change the look of your tiles without chiselling them all off the bathroom walls and having to call in the plasterer? Why not go for tile transfers to cover up an old pattern, or to jazz up white tiles. Or try some tile paint. This one perhaps needs a little extra skill than the first but a bit of patience and you can achieve a great look. Is your shower looking a little tired? 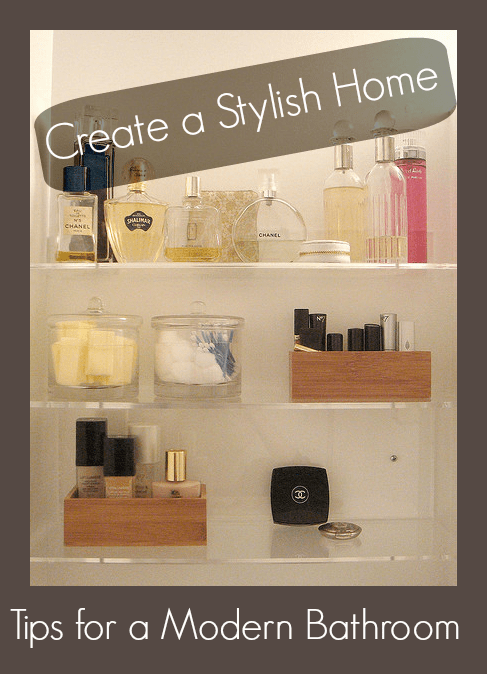 Do you need some extra shower storage for all those toiletries that are cluttering up the side of the bath? Adding new shower accessories like a new shower head or shower hose will look like you’ve replaced the shower completely and at a fraction of the cost. Treat yourself to a new shower caddy or storage unit and tidy up those shampoo bottles too. Many of us go for a window blind in the bathroom as it’s great for privacy, clean and simple and many stores sell co-ordinating patterns within a range. Blinds can become tired though so do think about updating them regularly. Have you considered shutters? The modern alternative that is so popular at the moment. Lots of new materials are coming onto the market that make them suitable for a bathroom environment. If you need more privacy add some window film to the top or bottom sections. Easily obtainable online from companies such as Brume, you could even add some personal wording or lettering into the film to give it a unique feel. Look upwards and check out your bathroom light. When was the last time you updated it? This is a great way to give your bathroom a modern feel with lots of great designs out there suitable for this room. Don’t forget your light fitting needs to the correct IP rating for the particular zone of the bathroom in which you would like to fit it. Retailers are very helpful though and mark this clearly on the outer packaging to help you along. A nautical ceiling light works well, but think about adding some wall lights, or even a mirror light too to create the right kind of mood for your evening bath. So there are lots of ways to update your bathroom and they don’t have to be difficult or cost a fortune. Have you made any changes to your bathroom recently? Do you have any other ideas that you’d like to add? Let me know in the comments below. Thanks for the tips they were great! I find that changing the light will can go a long way for your bathroom look. I’ve never worked with tile paint but I’m not an artist so I don’t know if that right for me. Thanks again for the ideas!